Here’s the latest tweet from Veeence! Finally, the untethered Jailbreak for iOS 4.3.1 for both Windows (redsn0w) and Mac (PawnageTool) will be launch this Sunday. However, the JB solution does not include the latest iPad 2 yet. 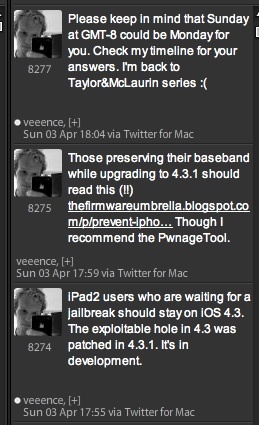 They must stay at iOS 4.3 if they wanted to JB on iOS 4.3.1 (in future).